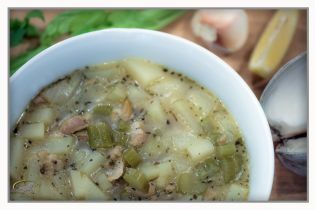 Home » Provence Kitchen® Recipes » Clam Chowder “A la Provencal” Dairy Free! No milk and no cream! A New England Clam Chowder with a French Provencal twist. It has no milk, no cream, not butter. It has white wine and herbs de Provence. What’s not to like? I grew up in Provence and spent most of my adult life in the Boston area. And I know, there is nothing better than a lobster roll and a fresh creamy clam chowder. The only problem is that most of the time you taste more the cream than the clams. And I love clams! So I came up with a Clam Chowder “A la Provencal” using you guessed it, no cream and no milk. To the contrary, my main ingredient is a dry white wine and a special spice that I have created and that I call French Seasoning with Herbs de Provence. Now you’re talking! The “juice” or left over broth of the clams is also added to the mix and makes a big difference. Without the cream I don’t feel the need to use crackers anymore. Instead I love to toast giant slices of sourdough bread in the oven, I rub some fresh garlic on one side and finish with a hint of extra virgin olive oil. Now, close your eyes, you are in Provence. For sure! Anyway here are the ingredients, and of course the fresher the better. For the wine I like to use white Burgundies. They are dry and yet full of flavors. This is the best and safest way to have the clams to open. Brush clean the clams under cold water. Put large pan on medium heat, add 2 cups of water and the salt. Bring to a boil, add the clams. Reduce heat and boil for 15 minutes. Remove the opened clams from pan and strain the broth into a clean container. Set aside. Remove clams from their shells and chop them up very thin. Cut the celery stalk into ¼ inch segments. Peel and rinse the potatoes, cut in ¼ inch cubes, set aside celery and potatoes. Rinse and dry up the pan that you used for the clam, add white wine Vinaigrette on high heat. Add chopped garlic and give it some color. Add the thinly chopped clams, season with the French Seasoning with Herbs de Provence and sauté for 3 minutes. Still in high heat add the white wine and cook for another 3 minutes. Stir in the celery and the potatoes, saute for 3 minutes. Add the clams’ broth and 2 cups of water, bring to a boil. Once it is boiling, reduce heat and cover for 20 minutes. Remove from stove and put aside for 15 minutes. Squeeze a hint of lemon and spray some chopped parsly just before serving. Savor with the toasted sourdough garlic bread.